The Center for the Study of the Pacific Northwest is dedicated to advancing scholarship on the Pacific Northwest, and the North American West more generally, with an emphasis on historical research. Located in the Department of History at the University of Washington, we support research, teaching, and public programs that promote and disseminate knowledge on the peoples and issues that have defined and shaped the Pacific Northwest. devoted to the study of the Pacific Northwest. The Center also supports graduate students, visiting scholars, faculty, and community organizations. 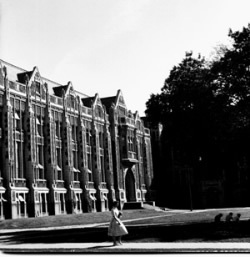 CSPN established by the University of Washington's Department of History. Colloquium series: "Indians and Whites in the Pacific Northwest"
Colloquium series: "City and Community in the Pacific Northwest"
Conference: "The Atomic West, 1942-1992: Federal Power and Regional Development"
Colloquium series: "Labor and Minorities in the Pacific Northwest"
Symposium: "Sacred Encounters: Indians, Non-Indians, and Religion in the American and Canadian Northwests"
Conference: "Power and Place in the American West"
Sick Lecture: Quintard Taylor, "From 'Freedom Now' to 'Black Power': Blacks, Asians, and Whites in Seattle's Civil Rights Movement, 1960-1970"
CSPN moves into its new home in Smith Hall. Symposium: "World War II: What it Took to End the War"
Conference: "On Brotherly Terms: Canadian-American Relations West of the Rockies"
State History Curriculum Project initiated. Lecture series: "The Frontier in American Culture"
Sick Lecture: Shelby Scates, "The Whole Load of Hay Falls on Maggie"
Symposium: "Mount Rainier National Park Centennial"
Conference: "The Nikkei Experience in the Pacific Northwest"
Sick Lecture: Robert Kaufman, "A Bridge Too Far: Senator Jackson's Quest for the Presidency"
CSPN receives the Governor's Award for Excellence in Teaching for its curriculum packets. Summer course and lecture series: "A Sense of Where We Are"
Co-sponsored annual Pacific Northwest History Conference, "History on the Edge and at the Center"
Symposium: "Imagining the Trans-Pacific West"
Conference: "Pacific Northwest Indian Treaties in National and International Historical Perspective"
Sick Lecture: Albert Furtwangler, "Bringing Indians to the Book"
Sick Lecture: Katrine Barber, "Death of Falls"
Co-sponsored Washington State History Day. Lecture series: "U.S. Empire in Comparative and Historical Perspective"
Sick Lecture: Lorraine McConaghy, "The U.S. Navy in the Antebellum West"
Symposium: "Race and Empire at the Fair: A Centennial Symposium on the Alaska-Yukon-Pacific Exposition"
Lecture series: "The Crossroads of Empire"
Sick Lecture: Andrew H. Fisher, "Shadow Tribe: The Making of Columbia River Indian Identity"
Sick Lecture: Patricia Susan Hart, " A Home for Every Child: The Washington Children's Home Society in the Progressive Era"